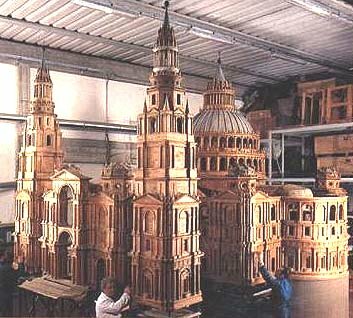 model to Julius Here's what Sangallo's version of St. Peter's would have looked like based on his model. 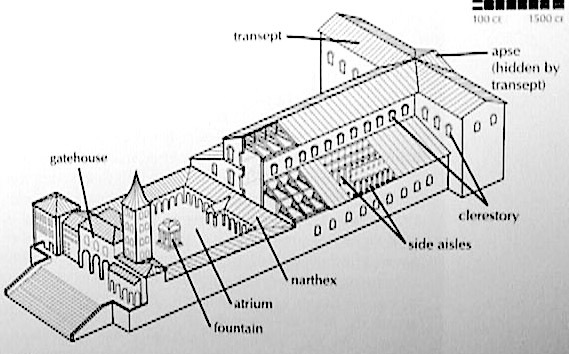 Stokstad has a section in her book in which she explains the original plans for St. Peter's c 315 CE all the way through the Renaissance. Read it before you read this article from the Brittanica. 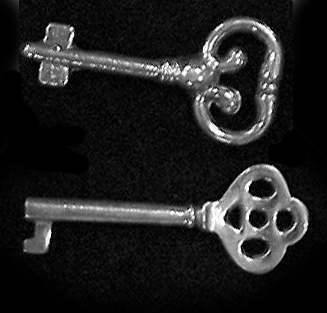 "St. Peter's." Britannica 2001 Standard Edition CD-ROM. Copyright © 1994-2001 Britannica.com Inc. November 30, 2002. 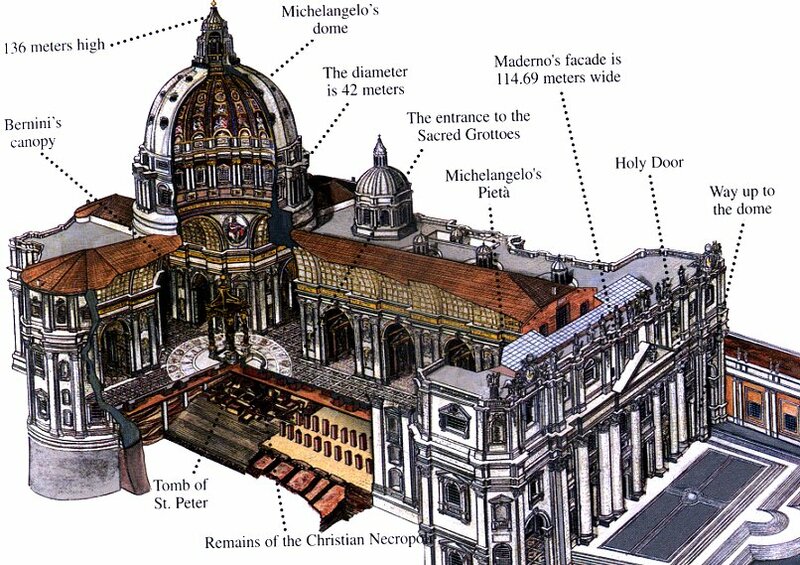 Protected by the fortified Castel Sant'Angelo, St. Peter's Basilica and the Vatican Palace gained precedence over the cathedral church and Lateran Palace during the papacy's troubled centuries. 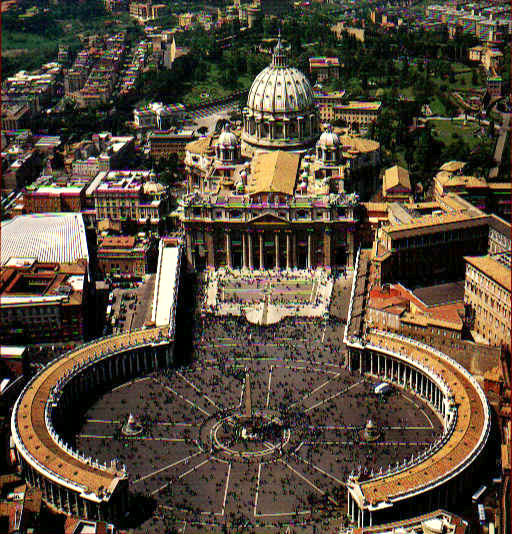 St. Peter's was built over the traditional burial place of the Apostle from whom all popes claim succession. 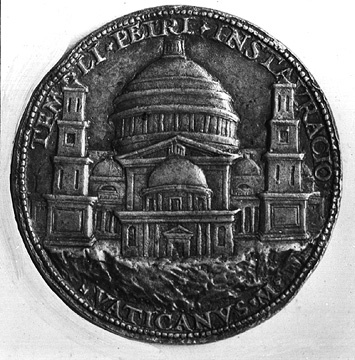 The spot was marked by a three-niched monument (aedicula) of AD 166-170. 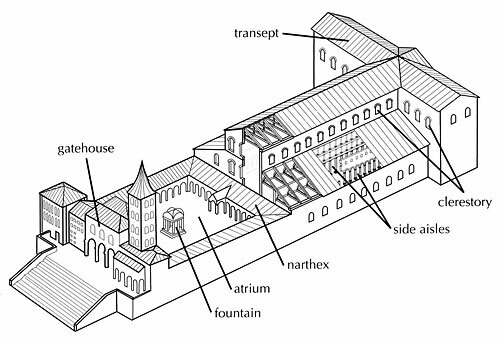 Excavations in 1940-49 revealed well-preserved catacombs, with both pagan and Christian graves dating from the period of St. Peter's burial. 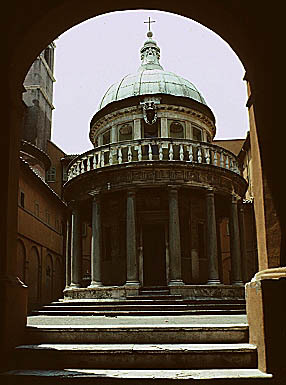 Michelangelo adapted Bramante's original plan, the effect being more emotional and mighty, less classically serene. 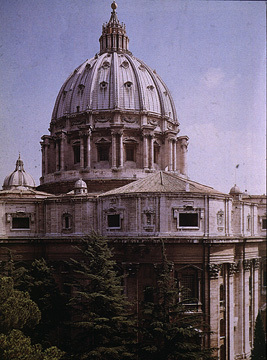 Of the exterior, only the back of the church, visible from the Vatican Gardens, and the dome are Michelangelo's. 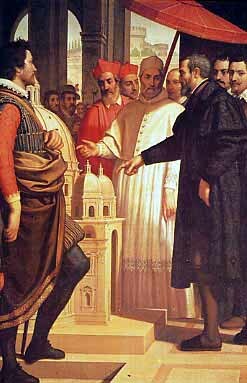 After his death Giacomo della Porta and Domenico Fontana, who executed the dome, altered the shape, making it taller and steeper than the original design. 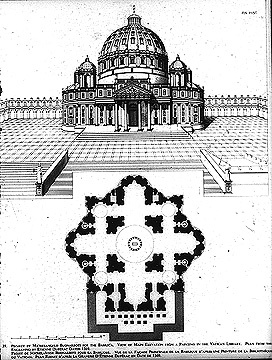 The east end remained unfinished, and it was there that Carlo Maderno was ordered to construct a nave, the clergy having won its century-long battle to have a longitudinal church for liturgical reasons. Thus, St. Peter's orientation reverses the normal. Maderno added a Baroque facade in 1626. 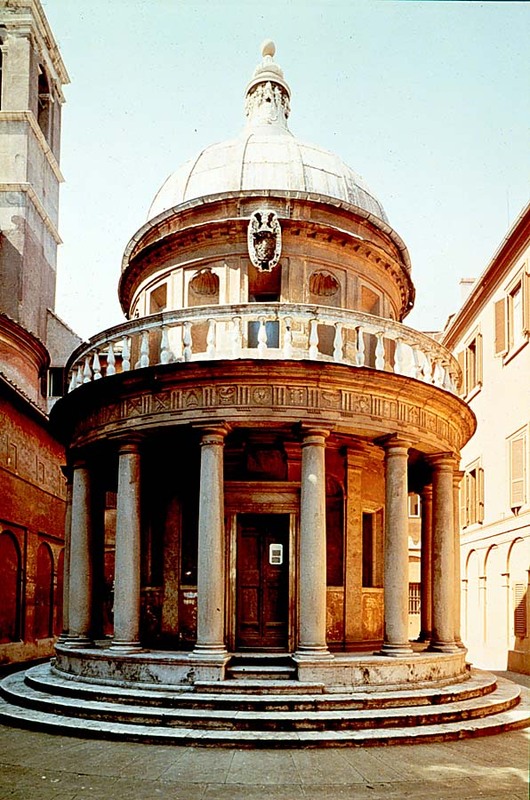 He was followed by Gian Lorenzo Bernini, who worked on the building from 1633 to 1677, both inside and outside. 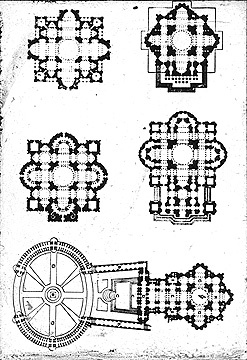 His pontifical crowd-funnelling colonnade in the shape of a keyhole around the piazza, a fountain for the piazza, the breathtaking baldachin, his several major pieces of sculpture, his interior arrangements for the church, and his dazzling Scala Regia (Royal Stair) to the Vatican exhibit his legendary technical brilliance and his masterful showman's flair. Before the lamentable assault in 1972, which damaged the sculptural masterpiece, one could enter the church and, in the first chapel at the right, see the "Pieta" (1499) of Michelangelo in the original splendor.